Nursing school may not be medical school, but there's no question it's challenging. In fact, for students managing a job, personal life and their nursing studies all at the same time, the challenge may seem insurmountable. How are you supposed to read all those chapters, attend labs, take notes, prepare for exams and remember everything you're learning while still maintaining some semblance of a normal life? It's hard, but it's also possible. The key is to study smarter, not harder. Below we'll explore proven study tips and strategies that will not only help you improve your performance in your nursing program, but help make life a little more enjoyable too. A fatal mistake many nursing students make is to leave their studies to the weekend, or procrastinate until exam time. There is no place for procrastination in nursing school. You can't cram a weeks worth of studies into just a few hours, or wait until the end of the semester and expect to learn everything you need to know to pass your nursing exam. A key to excelling in nursing school is to study a every day and stay caught up. Studying just a little every day is key to success in nursing school. One of the biggest obstacles of success for nursing students is poor time management. Effective time management is essential to succeed in nursing school. Nursing students who struggle with managing their time, and prioritizing, struggle. The most important aspect of effective time management is setting a schedule and sticking to it. At the beginning of each semester review your nursing syllabi for important dates, including assignment deadlines, clinical hours and exams. Once you've identified all important dates, use a planning device (calendar, phone, etc.) to keep track of these dates. Not writing down important dates at the beginning of each semester is a recipe for disaster. Now create a monthly and weekly schedule of that includes the tasks, milestones and goals for preparing for each of these dates. At the beginning of each week, plan your week identifying what you need to accomplish daily in order to meet your weekly goals. For more information on effective time management read Using Time Management to Improve Study Skills.. There aren't enough hours in the day to cover in depth all the material you'll be assigned to read and study as a nursing student. Part of your job is to determine what material is most important and where you're going to focus your study time. We recommend paying close attention to the topics your instructor covers in class. The topics your instructor focuses on, and the key points emphasized during lecture, is where you should focus the bulk of your study. Focus on critical thinking, not memorization. Most nursing exams use case-based or application-based questions. These types of questions are commonly referred to by nursing students as "NCLEX style" questions. 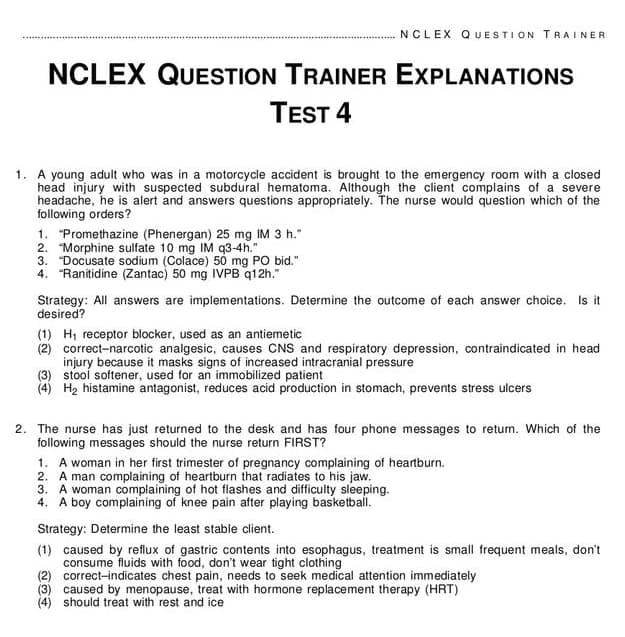 Typically, these questions employ a multiple choice format with four answer options, as shown in the NCLEX Question trainer examples below. Think critically - ask "why" and "why not"? What is the best way to develop critical thinking skills? Repetition and practice. So attend class, do all your homework and exercises, and stay involved in the learning process. Think about the application of what you're learning. Becoming a nurse is much more than just acquiring medical knowledge and facts. Your patients aren't going to care what you know, they're going to care how you can help make them feel better. As you study different health conditions and explore human physiology, always ask your self how you're going to apply what you're learning to help your patients become healthier. Think about how you would discuss each conditioin you study with a prospective patient. Do this and you'll not only become a better nursing student, but a better nurse. Nursing school requires a lot of learning. And much of what you learn is going to come from reading. To facilitate learning through reading, skim each chapter of your textbook before reading the entire chapter. As you skim the chapter, try to get a sense of the main themes and topics being covered. Read the chapter headings and subheadings. Review the chapter summary and any end of chapter questions. Try to determine what information is most important and then go back and read the entire chapter with purpose. A key to effective learning is discovering your learning style. Everyone has different learning preferences that benefit them. Some students have a dominant learning style. This means they learn best when they acquire information in a specific way. For example, some students learn best through seeing (visual learners). Others learn best through listening (auditory learners). And some students learn best through hands-on, tactile interaction (kinesthetic learners). If you learn best by writing out your class notes, then you may be a kinesthetic learner. Discovering your learning style will help you structure your study of nursing in a way to provide optimal efficiency and effectiveness. You learn about the seven learning styles by reading Discover Your Learning Style. There are numerous advantages to forming a study group, but the No.1 reason to use a study group is that studying with others facilitates learning. Studies show that when students study with other students they retain significantly more information than through listening to class lectures or reading a textbook. Study groups provide the opportunity for each group member to teach what they've learned to the other group member – and there really isn't a more effective way to learn something than by teaching it others. To discover all the benefits study groups can provide and learn how to form an effective study group, read Using Study Groups. Nursing students tend to study by health condition. For example, they'll study six health conditions from three different systems. We recommend studying by system. The advantage of studying by system, as opposed to condition, is (1) it saves time and energy to group everything for each system together for review and (2) medical and nursing management usually follow a similar treatment route, hence, studying by system prevents you from over-studying. When studying pharmacology, the same reasoning applies. Study drugs according to their purpose as they related to individual body systems. Include study breaks in your studying. Your brain starts to become overloaded with information after about an hour or so of studying. Continuing to study after your brain is full is ineffective. Studying for 3 or more hours at a time without taking a break is not the best way to retain information. The most effective studying occurs during short 45 to 60 minute study sessions with breaks in between. When you take a break, actually get up from where you're studying and participate in some other activity for at least 10 minutes. This will allow your brain to decompress and prepare to learn and absorb more information. Vary your study materials and methods. Varying your study materials and methods will improve your ability to retain and recall what you study and learn. Most students only remember about 10% of what they read from a textbook. However, students who are able to teach material or concepts to others effectively, retain about 90% of what they've learned through teaching others. 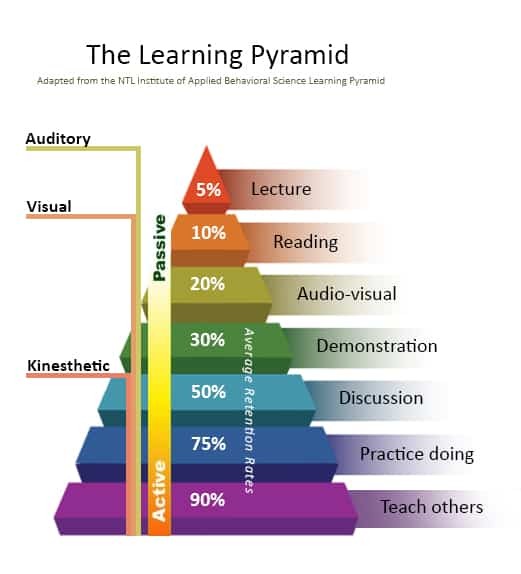 The evidence is clear, varying your study method, as demonstrated in the Learning Pyramid below, will lead to much stronger and long-term learning. Learn more about the real value of The Learning Pyramid. Not everything you'll need to know as a nurse is found on the NCLEX exam, but if you orient your study toward the NCLEX, you'll be better prepared come test day. The NCLEX requires a great deal of preparation so we highly recommend not putting off preparing for the NCLEX until graduation. Incorporate NCLEX preparation into your regular study throughout your schooling.